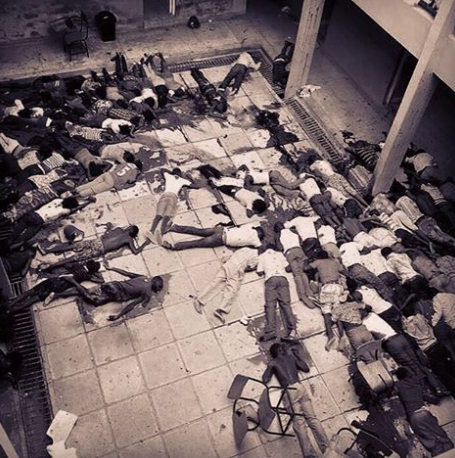 On Thursday, 2nd April 2015, only a few days short of Easter, a group of Islamist terrorists from Somalia, with Kenyan connections, slaughtered 150 unsuspecting students. It seemed at first that the students at the Garissa University in Garissa, Kenya were killed indiscriminately. But a more complete picture has emerged since the massacre. Only Christian students died in this predominantly Christian university of 800 students, of which 200 were Muslims. The Al Shabaab terrorists were exclusively selecting Christians for the execution. The killing started with the attack on the unsuspecting Christian Union students who meet for the time of fellowship and morning prayers. FOCUS – Fellowship of Christian Unions, a Christian student organization in Kenya stated: “We can confirm that the Christian Union members in a prayer meeting in Garissa University College were among the first targets of the terrorist attack. It appears most of whom died.” IFES, International Fellowship of Evangelical Students reports that “at least five FOCUS’ Executive Committee members and several other leaders are gone.” “All of a sudden I saw them throw explosives were the Christian Union members were praying”, The World Watch Monitor quoted a survivor. The massacre continued for 15 hours. “If you were a Christian, you were shot on the spot,” one survivor said. “ Some survivors heard the terrorists mocking, “We are here to make your Easter Holiday better”. Reuters reported that the attackers “stalked classrooms and dormitories hunting for non-Muslim students.” Reuters also quoted a survivor who witnessed the shooting of three girls when they were pleading for mercy and praying “Jesus, please save us”. Most of the victims were lined up and shot ‘execution-style’ in the back of their heads. But not everyone is quiet. A visible group of Christian leaders honored the victims of the Easter massacre in Kenya by releasing and endorsing the “Urgent Call for Solidarity & Prayer for Persecuted Christians”. “This Holy Week we are calling upon Christians to also reflect upon the crucifixion, beheading, stoning, enforced slavery, sexual abuse, human trafficking, harassment, bombing and displacement of hundreds of thousands of Christians – and others – whose faith alone has made them a target of religious extremists”, stated the document launched by Cardinal Timothy Dolan, and movie producers Roma Downey & Mark Burnett, and endorsed by many Christian leaders in the US. Sadly, the Call for Solidarity went almost unnoticed by the mainstream media although it was co-signed by 80 faith leaders. The recent massacres of Christians committed by ISIS, Boko Haram, Al-Shabaab, Al-Qaeda and alike have contributed to making Christians today the most persecuted faith group. According to Open Doors, one of the best known organizations serving persecuted Christians worldwide, states that “every month 322 Christians are killed for their faith, 214 churches and Christian properties are destroyed, and 722 forms of violence are committed against Christians”, including “beatings, abductions, rapes, arrests and forced marriages”. Although very conservative and incomplete those numbers speak volumes. It is evident that the Garissa University attack was intended against Christians only. This atrocity, like many other of the kind committed in Syria, Iraq, Libya, Pakistan, Nigeria and elsewhere, regardless of how many lives were lost, are always the work of the depraved minds, whose mastermind is the devil himself “who prowls around like a roaring lion” looking to devour as many people as possible. 1. Peter 5:8. It is s not an exaggeration to conclude that all those brazen killings of so many innocent people that we have witnessed lately, especially of Christians just because they are Christians, or Muslims only because they are ‘Muslims of a different kind’, or Jews just because they are Jews at the hands of various kinds of Islamist terrorist is a form of devil worshiping. No God who is worthy to be worshiped and revered could ever be behind any form of evil. And this is why all people of sober mind need to get together, Muslims including, and condemn with clarity and directness the current wave of ideologically driven terrorism in the world. Together we need to say to the bloodthirsty fanatics, “We are not afraid of you! You do not speak for us! Your murderous acts are an abomination in God’s eyes. Repent from you works of darkness and turn to the living God so that your sins may be forgotten.” Acts 3:19. Moreover we need to join the prayers of millions of followers of Jesus worldwide as we seek the Lord to bring very much needed comfort and provide sufficient strength to all who lost their daughters and sons, brothers and sisters more than week ago in the terrorist attack on the Garissa University in Kenya. At this time our prayers need to be focused also on the need for reconciliation and tolerance in the Kenyan universities, says one of my friends, a young leader from Kenya in the email I received from him today. “We are concerned about what is going on in the Universities now. By the grace of God we need to spread the message of love”, says my Kenyan friend. This entry was posted in Africa, Crime, Current Issues and tagged Africa, Al-Shabaab, Beheading, Call for Solidarity, child abuse, Christian Union, Christians, Christians killed, Crime, Execution, FOCUS, Garissa University College, harrasment, Iraq, Kenya, Murder, Muslims, Open Doors, Pakistan, Persecuted Christians, Persecution, slavery, Syria, Terrorism. Bookmark the permalink. Thanks so much for sharing this post and drawing attention to this horrible travesty! I will be spotlighting it at ufuomaee.godinterest.org, to go live in a few hours. May God comfort the families of the fallen, and visit the enemies of our faith with His holy judgment.